Another sheet mask review, because I currently on a sheet mask addiction! I brought this while I was in Hong Kong. You can purchase this from Watson stores or online. The one I purchased in particular is a single facial mask and eye mask. It is also available in a box of 6 facial masks. Descriptions: "For centuries, bird's nest has been recognised as one of the most valuable beauty supplement. 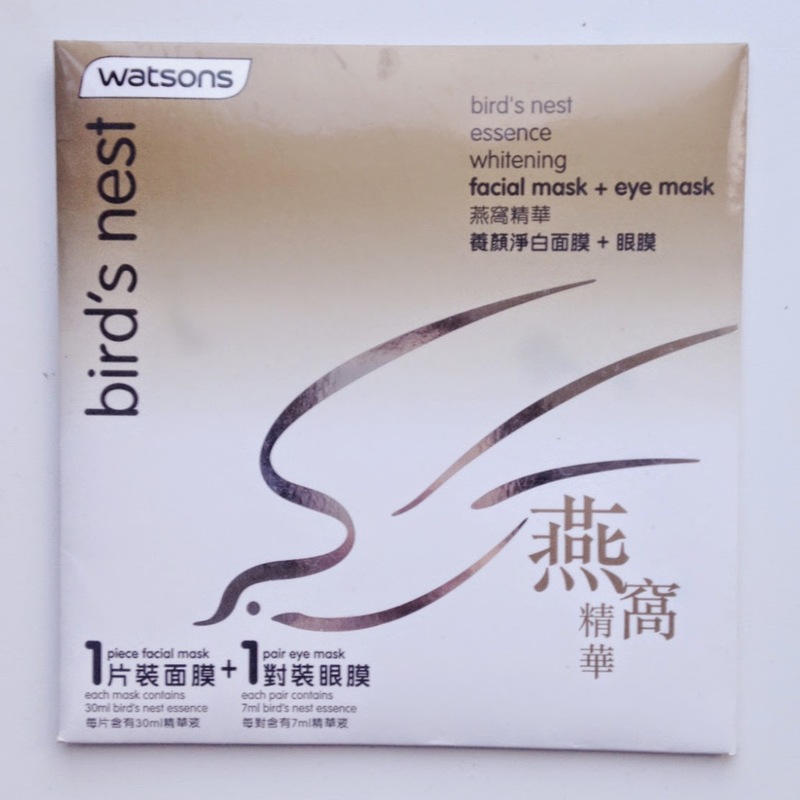 With its nourishing power, Watsons Bird Nest Facial Mask leaves your skin silky smooth and with natural radiance." Benefits: "Maintains skins youth glow and fairness. Energises skin to enhance natural resilience and preserve vitality of skin"
When I opened the packaging, the scent was very VERY strong, it does fade however some people may find it overwhelming. It reminded me of Comfort - a UK brand fabric conditioner... The sheet was soft and slightly thicker than other sheet mask, so it won't tear. Neatly folded and drenched in a rich gel-like solution. The sheet has multiple slits, so that you can adjust it accordingly to your face shape. It also has a flaps for the eyes, which is really nice feature when laying down. I used this mask after cleansing my face and left it on 25 minutes. I was quite disappointed with the results; considering the solution was rich, you would think that it would leave your skin plumped, that was not the case - I did not notice any hydration to my skin. It also left some residue and excess essence behind, which took a while for my skin to absorb. On the bright side, my skin tone was slightly more evened. Would I recommend? : Nope - probably the worst mask I have a tried so far. It did not offer any hydration and left quite a bit of residue. Not much benefit to my skin. just followed you back, hope wee stay in touch! Aw it sounded like a good mask despite it's cons. I think I'll pass on this ask~! I love masks that moisturizes! String scent and leaves residue? I will pass this. Would you like to follow each other? Let me know when you do so that I can follow you back! Stay in touch. Hello! Just followed your blog via GFC, love it!! Follow me? I've visited your blog the first time and I love your design! Thank you ^^ sure that would be great! too bad it didn't work out for you, but at least we got to read an honest review. Thanks fro the recent visit on my blog and for the follow. I really appreciate it! Following back.. Thank you ^^ sure that would be lovely! What a pity!! I'm on a sheet mask addiction, too! I purchased some blueberries masks from Korea lol I can't wait to try them out!! Thanks for the honest review!! Wooo high5! Oooo i hope you write a review on them~ ^^ Thanks for reading!